The re‑designed CHALLENGAIR® 2000PV Dryer Plus Vacuum from Double K is now quieter and has a larger bag to make grooming even easier and more convenient. Vacuums away loose hair, dirt and dust as you brush the coat. The durable CHALLENGAIR® 2000P.V. 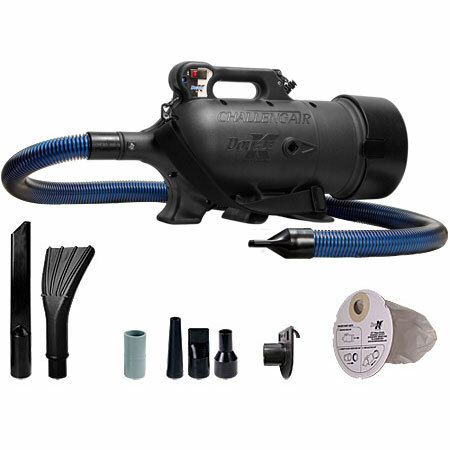 quickly converts to shop vac, auto vac or powerful blower to clean areas all around the shop and home. It can be used to quickly dry dogs and other pets with show ring results. The “clam shell” housing makes service much easier. Includes 8 versatile attachments. Uses heavy duty disposable vacuum bags. Two year limited warranty. Contact Double K at (800) 821‑9449 or use the Distributor/Dealer Locator link in the top menu of this page to find a distributor near you.